Every day, the Earth spins once around its axis, making sunrises and sunsets a daily feature of life on the planet. It has done so since it formed 4.6 billion years ago, and it will continue to do so until the world ends — likely when the sun swells into a red giant star and swallows the planet. But why does it rotate at all? But why was the solar system spinning in the first place? The sun, and the solar system, formed when a cloud of dust and gas collapsed due to its own weight. Most of the gas condensed to become the sun, while the remaining material went into the surrounding, planet-forming disk. Before it collapsed, the gas molecules and dust particles were moving all over the place, but at a certain point, some gas and dust happened to shift a bit more in one particular direction, setting its spin in motion. When the gas cloud then collapsed, the cloud's rotation sped up — just as figure skaters spin faster when they tuck their arms and legs in. Because there isn't much in space to slow things down, once something starts rotating, it usually keeps going. The rotating baby solar system in this case had lots of what's called angular momentum, a quantity that describes the object's tendency to keep spinning. As a result, all the planets likely spun in the same direction when the solar system formed. Today, however, some planets have put their own spin on their motion. Venus rotates in the opposite direction as Earth, and Uranus' spin axis is inclined 90 degrees. Scientists aren't sure how these planets got this way, but they have some ideas. For Venus, maybe a collision caused its rotation to flip. Or maybe it began rotating just like the other planets. Over time, the sun's gravitational tug on Venus' thick clouds, combined with friction between the planet's core and mantle, caused the spin to flip. 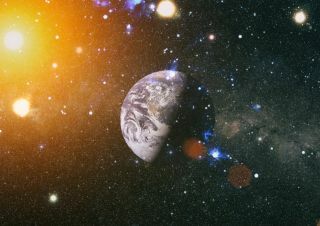 A 2001 study published in Nature suggested that gravitational interactions with the sun and other factors might have caused Venus' spin to slow down and reverse. In the case of Uranus, scientists have suggested that collisions — one huge crash with a big rock or maybe a one-two punchwith two different objects — knocked it off kilter, Scientific American reported. Despite these kinds of disturbances, everything in space rotates in one direction or another. "Rotating is a fundamental behavior of objects in the universe," Naoz said. Asteroids rotate. Stars rotate. Galaxies rotate (it takes 230 million years for the solar system to complete one circuit around the Milky Way, according to NASA). Some of the fastest things in the universe are dense, whirling objects called pulsars, which are the corpses of massive stars. Some pulsars, which have a diameter about the size of a city, can spin hundreds of times per second. The fastest one, announced in Science in 2006 and dubbed Terzan 5ad, rotates 716 times per second. Black holes can be even faster. One, called GRS 1915+105, may be spinning anywhere between 920 and 1,150 times per second, a 2006 study in the Astrophysical Journal found. But things slow down, too. When the sun formed, it spun once around its axis every four days, Naoz said. But today, it takes about 25 days for the sun to spin once, she said. Its magnetic field interacts with the solar wind to slow its rotation, Naoz said. Even Earth's rotation decelerates. Gravity from the moon pulls on Earth in a way that ever so slightly slows it down. A 2016 analysis in the journal Proceedings of the Royal Society A of ancient eclipses showed that Earth's rotation slowed by about 6 hours over the last 2,740 years. That comes out to just 1.78 milliseconds over a century. So, while the sun will rise tomorrow, it just may be a tad late.